Insufficient hearing protection is a problem. Militaries know this and are addressing this in partnership with industry. Steve Rist, Product Manager, Racal Acoustics explained, “There are large numbers of soldiers, returning from battlefield situations with varying degrees of hearing loss. That is partly because of blasts from Improved Explosive Devices (IED) but it also partly due to the noise from friendly heavy machine gun and rifle fire, adjacent to the head. That could mean that they are unfit for further military service in the Army but it could also mean that they are no longer fit for work.” Outside the human cost, the operational penalties are significant. So too, are the financial consequences, figures show that in 2007 alone, military related hearing loss claims in the US exceeded $1billion. “If you are in theatre and your hearing is temporarily impaired, by a blast or gunshot, it then restricts your ability to hear things going on around you and may put you in a greater amount of danger, for example, if you are nearby a roadside bomb and it goes off, and then don’t hear the truck coming, you can’t respond,” explained Rist. It’s not just protection; communication and clear communications are an important contribution to increasing operational tempo in theatre. Clear communication needs not only to be resistant to being interrupted by impulse noise but to also give the dismounted soldier the ability to get on and off lower noise platforms such as Armoured Fighting Vehicles (AFV) and not have to keep on putting on multiple layers of hearing protection. One of Racal Acoustics’ approaches to hearing protection is to use an in-ear device with a choice of either foam tips or a custom moulded type ear insert. Different customers have different preferences. Racal Acoustics has recently been awarded a contract to supply its Frontier1000 system to the UK MoD for the Personal Interfaced Hearing Protection System (PIHP) project. 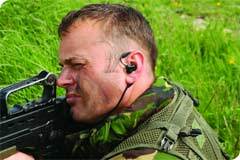 This is a new system consisting of two parts - custom-moulded ear plugs for each soldier and a small interface box housing a device that reduces the sound level of the firing and explosions to the soldier, whilst still being able to talk and listen to their colleagues on the ground. The proposed new system will connect to the soldier's personal radio which in turn interfaces to BOWMAN, replacing the existing boom-mic and head-set. 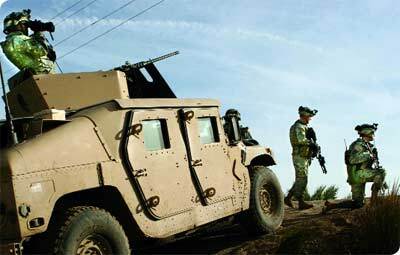 This provides protection from impulse noise, hearing protection on wheeled vehicle platforms and delivers clear radio communications. It is currently in the pre-deployment training and testing phase which will lead to manufactured products being deployed in April 2009. In July 2010, things change. Until that point the UK MoD and many other militaries had had the goal of reducing noise down to 85dB, purely as an advisory measure. In roughly eighteen months time, it becomes mandatory.